Blue-green algae Spirulina platensis, like other cyanobacterias, uses proteins called phycobiliproteins to harvest light for photosynthesis. Phycobiliproteins, can be used in photodynamic therapy . One of the basic proteins of Spirulina platensis is C-phycocyanin (C-PC), which is used as fluorescent protein probe in living cells . Phycocyanin, a natural blue pigment that is the major light-harvesting biliprotein in the blue-green alga Spirulina platensis, reduces normal tissue photosensitivity due to its fast metabolism in vivo . Phycocyanins extracted from Spirulina are used as industrial and food coloring agents. The blue color gives the phycocyanins fluorescence properties and the intense fluorescence is exploited in immunoassay tests . In , protective role of dietary Spirulina at lead poisoning was studied in Swiss albino mice. Significant increase of the survival time was observed in preand post-treating by Spirulina compared with the control group without Spirulina treatment. Rats with high mercury dosage showed increased levels of blood urea nitrogen (BUN) and serum creatinine, both indicators of acute nephritis. Addition of 30% Spirulina to the diet resulted in significant decrease of (BUN) and serum creatinine levels. Rats showed the similar kidney improvement after Spirulina diet . A tetrapyrrole-based chromophore was obtained through the methanolysis of C-phycocyanin extracted from Spirulina platensis, and was found to act as a selective receptor for Hg(II) at physiological pH conditions . Spirulina contains several active ingredients, notably phycocyanin and β-carotene that have potent antioxidant and antiinflammatory activities. C-PC can be successfully used as an anti-inflammatory drug and liposomal encapsulation is effective in improving its anti-inflammatory activity . Phycocyanin has the ability to scavenge free radicals, including alkoxyl, hydroxyl and peroxyl radicals. It should be noted that “Brilliant Violet” reporters are dramatically brighter than other UV-violet excitable dyes, and are of similar utility to phycoerythrin (PE) and allophycocyanin (APC) . To use algal biomass, it is important to understand the nature of the metal binding process with its components. In this work, effects of Hg(II) and Pb(II) ions on Spirulina platensis C-PC are presented using Fluorescence spectroscopy. Also influence of DNA on Hg(II)- and Pb(II)-C-PC complexes is explored. C-PC was isolated from culture of Spirulina platensis (strain IPPAS B-256) in our laboratory according to the Teale and Dale method  with some modifications. Extraction of C-PC was carried out in 0.1 M Na, K phosphate buffer at pH 6.0. Initially, the preparation was purified by deposition in saturated (NH4)2SO4 solution. The final stage of purification was performed on chromatography column filled with DEAE-cellulose, previously equilibrated in 50 mM acetate buffer, pH 5.2. To determine the degree of purity of the samples, spectrophotometric (wavelengths 250 - 750 nm) and electrophoretic methods were used. The concentration of C-PC was determined by ultraviolet-visible spectroscopy using a value of ελ = 615 nm =279,000 M−1∙cm−1 for the absorption coefficient. The purity of the protein was assessed from the ratio of absorbances at λ = 615 nm and λ = 280 nm (A615/A280 ≥ 4). Fluorescence spectra were measured in 1 cm3 quartz cells using a laser fluorescence spectroscopy. Fluorescence titration was performed in the range 400 - 700 nm, by adding a metal solution to C-PC and recording the spectrum after each addition. The solutions were excited at 488 nm and the fluorescence intensity was monitored at 635 nm. The fluorescence spectra of C-PC in the presence of Hg(II) and Pb(II) ions are shown in Figure 1. The intensity of C-PC fluorescence, observed in the range of 580 - 690 nm, was measured as function of added metal concentration. Metal free C-PC had fluorescence maximum at 635 nm (curve 1). The increase of the metal concentration caused decrease of the peak height accompanied by blue shift in both cases (8 - 15 nm). It is in good agreement with literature data , where SPDPC-PC, from Spirulina platensis using one-step anion-exchange chromatography was studied. The obtained C-PC had its absorption maximum at 620 nm and the fluorescence emission maximum at 640 nm. SPDP is an excellent heterobifunctional crosslinker for thiolating amines. 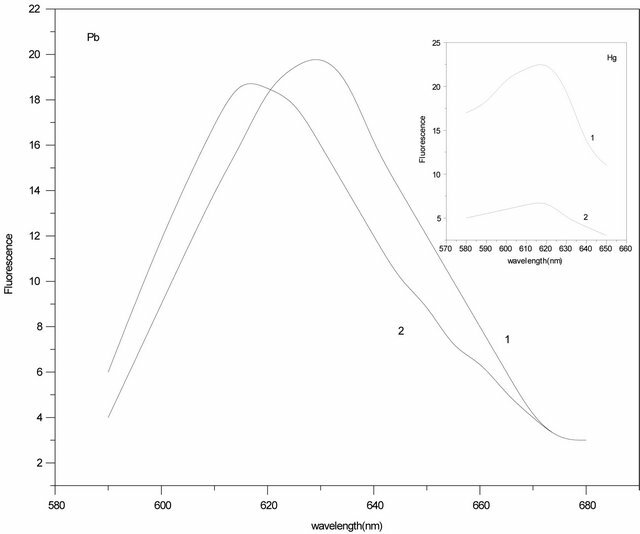 Different molar ratios have significant influence on the absorption and fluorescence spectra of C-phycocyanin. The absorption maximum and fluorescence emission maximum both decreased and blue-shifted from 640 nm to 630 nm as the molar ratio of SPDP increased. Similar results were obtained for other metal ion-C-PC interactions [12,13]. The interaction of metal and Phycocyanin was investigated by ultraviolet-visible, fluorescence and infrared spectra. The study showed that the characteristic absorption of PC at 615 nm decreased gradually with increase of metal concentration and interaction time. Accordingly, the fluorescence emission peak and two fluorescence excitation peaks also decreased for Ag(I)-C-PC complexes . Dynamic formation of nano-Ag(0) was also observed by synchronous fluorescence spectra, showing that Ag(0) was formed by the PC in situ reduction. 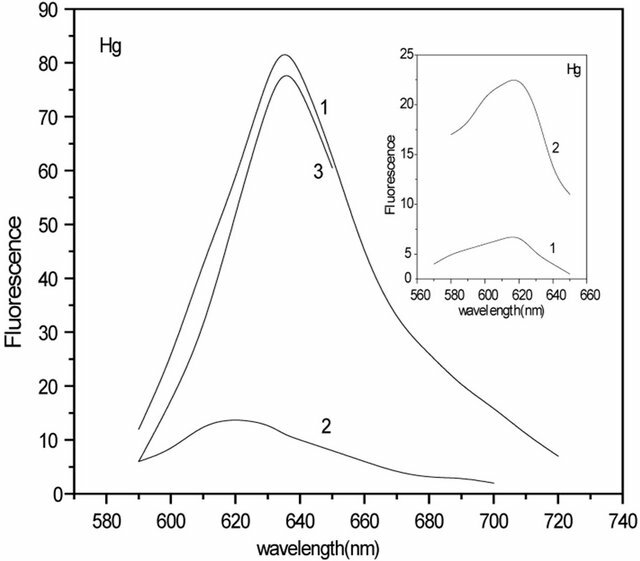 Figure 1 insert, where normalized fluorescence spectra of C-PC in the absence and in the presence of Hg(II) and Pb(II) ions are shown, also confirms this. It is clear from Figure 1 that quenching has not been saturated even at high concentrations of metal ions. 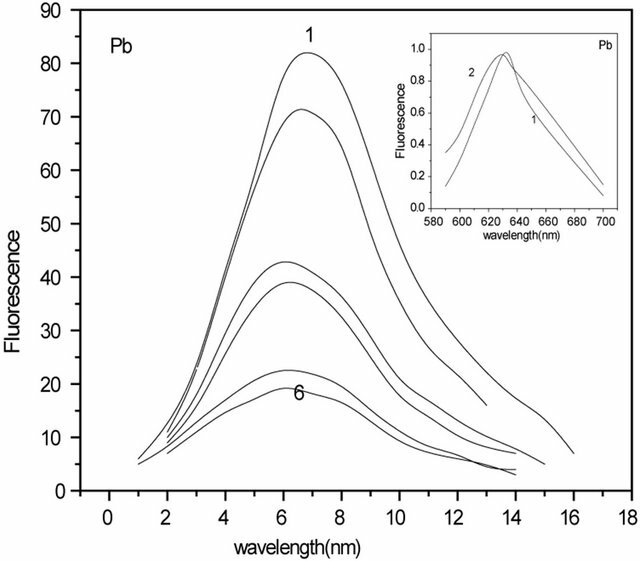 Addition of Hg(II) ions above 7 µM and of Pb(II) ions above 20 µM, has no further effect on the fluorescence intensity, which indicates that their binding to C-PC is saturated. The absence of saturation in the quenching plot even when the binding is saturated indicates that only a fraction of the binding sites quenches the fluorescence. This is clear also from Figure 2 and from Figure 2 inserts. In Figure 2 inserts, there are presented fluorescence spectra of C-PC in the presence Hg(II) and Pb(II) ions at amplification 3.5, CHg: 7 µM and CPb: 21 µM (curve 1), similar to Figure 1, and the same spectra, when amplification is 8.5 (curve 2). In Figure 2, there are shown fluorescence spectra of C-PC with and without Hg(II) and Pb(II) ions: 1) C-PC spectrum (curve 1); 2) residual fluorescence of C-PC after addition of Hg(II) ions (curve 2); 3) differential spectrum obtained as the difference of (1) and (2) and corresponding to “quenched” residuals of C-PC (curve 3). Figure 1. 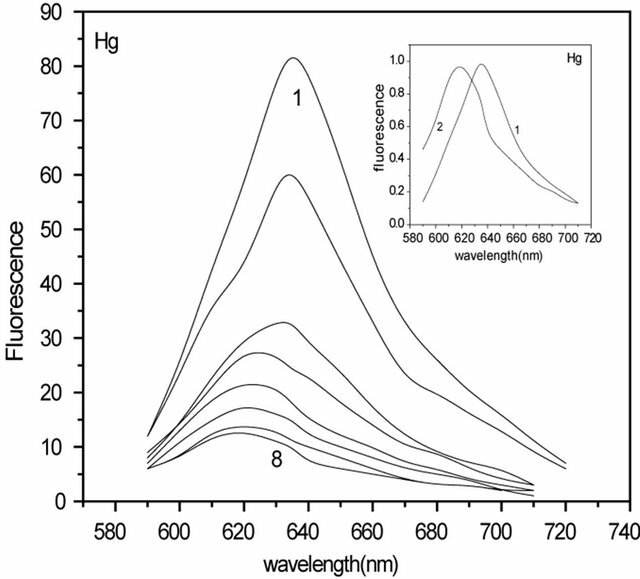 Fluorescence spectra of C-PC (0.4 mM) at different concentrations of Hg(II) and Pb(II) ions. Wavelength of excitation was 488 nm and that of monitoring was 635 nm. (CHg: 0 - 7 mM). (CPb: 0 - 20 mM). 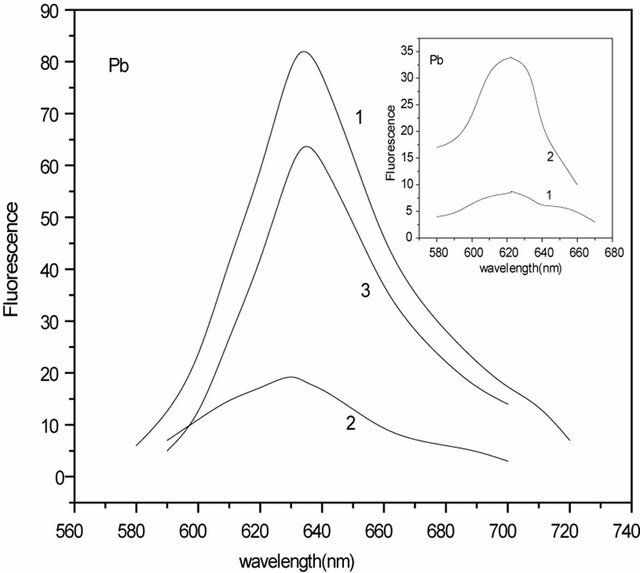 Insert: Normalized fluorescence spectra of C-PC (0.4 mM) in the presence (2) and in the absence (1) of Hg(II) and Pb(II) ions. Figure 2. Fluorescence spectra of C-PC with and without Hg(II) and Pb(II) ions: C-PC spectrum (curve 1); Residual fluorescence of C-PC after addition of Hg(II) ana Pb(II) ions (curve 2); Differential spectrum obtained as the difference of (1) and (2) and corresponding to “quenched” residuals of C-PC (curve 3). Inserts: Fluorescence spectra of C-PC (0.4 mM) in the presence of Hg(II) and Pb(II) ions, when amplification is 3.5 (curve 1) and 8.5 (curve 2) at CHg: 7 μM and CPb: 21 μM. The quantitative analysis of quenching efficiency is based on the classic Stern-Volmer equation (I0/I = 1 + KSV [C]), where I0 and I are the fluorescence intensities without and with metal ions, [C] is the metal cation concentration and KSV is the quenching constant (SternVolmer). KSV values for C-PC fluorescence quenching by Hg(II) and Pb(II) metal ions were 10 ´ 105 M−1 and 2 ´ 105 M−1 respectively. In order to study DNA-metal-C-PC ternary complexes, we have investigated influence of DNA on C-PC-metal (Hg(II) and Pb(II)) fluorescence. It was found that DNA had no effect on Pb(II)-C-PC complex while affecting Hg(II)-C-PC. The C-PC (1), C-PC-Hg(II) (2), and C-PCHg(II)-DNA (3) spectra are presented in Figure 3. As one can see, intensity of C-PC fluorescence decreases with addition of Hg(II) ions, but adding of 100 µM DNA to the solution, leads to increase of the intensity (~10%). Further increase of DNA concentration has no effect on the fluorescence intensity. Based on this, it may be assumed that DNA “takes off” some part of Hg ions from C-PC. Analogous results were received for Ag(I)-C-PCDNA complexes . In contrast to mercury ions, adding of DNA to the lead-PC complex, no increase of fluorescence intensity was observed meaning that all lead ions stay bounded to C-PC. Figure 3. 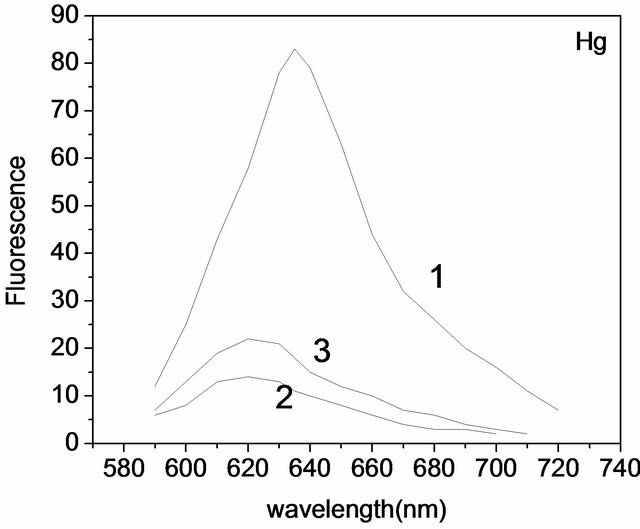 Fluorescence spectra of: 3.2 μM C-PC (1); 3.2 μM C-PC + 8 μM Hg(II) (2); 3.2 μM C-PC + 8 μM Hg(II) + 100 μM DNA (3). reach. Insert in Figure 4 represents the spectrum of 0.4 mM C-PC + 8 mM Hg(II) (curve 1) and the same sample after a day (curve 2). As is seen from the graphs, fluorescence intensity decreases by time. Relying on the obtained result, we may assume that in the process of mercury binding to C-PC, conformational alteration of the protein takes place that makes large amount of the protein fluorophores available for mercury ions. Based on the results obtained, one may conclude that DNA affects the Hg(II)-C-PC complex and not Pb(II)- C-PC even though Stern-Wolmer constant for Hg ions is higher than that of lead. Figure 4. Fluorescence spectra of: 0.4 μM C-PC + 16 μM Pb(II) (curve 1) and the same a day later (curve 2); Insert: Fluorescence spectra of: 0.4 μM C-PC + 8 μM Hg(II) (curve 1) and the same a day later (curve 2). disposition of chromophores. The phycobilisome lightharvesting antenna in cyanobacteria and red algae is assembled from two substructures: a central core composed of allophycocyanin surrounded by rods that always contain phycocyanin (PC). Unpigmented proteins called linkers are also found within the rods and core. Analysis of rod crystals showed that the crystals contained rods composed of two hexamers . Hexamers of α and β-subunits mostly form globule; so, in C-PC the negative electrostatic field of hexamer is dominant. It is quite possible that such distribution of the charge plays an important role in interaction with metal ions. In particular, the toxic metal ions are electrostatically attracted to the strong anionic field in the center of the hexamers. On the other hand, it is known from literature that b-84 chromophore of C-PC links to a-84 chromophore as to its neighboring monomer [16-19]. Because of it, b-84 and a-84 can be considered as a chromophore pair located on the protein surface. Another such pair of chromophores in C-PC is b-155 b-155 [16-19]. The nature of excited states involving the alpha84 and beta84 is phycocyanobilin pigment dimmer of C-PC . This paper offers new experimental evidence suggesting that electronic relaxation proceeds by the energy transfer between alpha84 and beta84 pigment sites. C-Phycocyanin (PC) trimers associated with linker polypeptides were isolated from the phycobilisome (PBS) rods of Synechococcus sp. PCC 7002. It was observed excitonic coupling interaction between neighboring alpha 84 and beta 84 chromophores. Structurally, the linker polypeptide should disrupt the C3 symmetry in the central cavity of the associated phycobiliprotein and this asymmetric interaction should serve to guide the transfer of excitation energy along PBS rods toward the core elements . Fluorescing phycobilisomes are more prevalent along the outer thylakoids . Carotenoids were prevalent in the cell wall and also were present in thylakoids. These results show that hyperspectral fluorescence imaging can provide unique information regarding pigment organization and localization in the cell. According to the Forster’s theory [19,23,24], b-155 and β-84 in C-PC are a fluorescent chromophores. Therefore, it is possible that quenching by metals, its degree and blue shift are determined exactly by effectiveness of their interaction with b-155 and β-84. b-155 is hidden in the depth of the protein molecule, in contrast of β-84 [19, 24,25] within nonpolar environment created by the protein molecule. Interaction with the metal changes the environment and leads to the blue shift. It is known from the literature data that metals preferentially bind with thiol groups of proteins. Thus, it is quite possible that cystein in β-155 and β-84 positions are specific binding sites for metal ions in C-PC. Method of fluorescernce quenching assumes availability of fluorophores of the solvent, or the solvent itself and ability of the quencher to penetrate into the protein. At high metal concentrations, all available fluorophore residues are quenched. The remaining fluorescence is determined by the fact that metal ions can’t reach the residues to be quenched, as their fluorescence are no more dependent of the concentration. Unquenched concentration is caused by the residues hidden in the depth. This is easy to see in Figure 4. As it was expected, fluorescence of these residues is shifted to the long-wave region (3). Differential spectrum proves that intensity of irradiation of quenched residues at ~635 nm is the same as that of C-PC. Such spectral shift is indication of selectivity of certain fluorophore groups at quenching. On the other hand, action of metal ions depends on the chromophore structural state. It is known that chromopfore in C-PC is phycocianobilin [16,17], which is attached to the thioester group in a-84 and b-84 positions. Both a and b subunits create helical structure preferentially in a hexamer form. Their interaction with the core protein environment leads to different spectral characteristics. On the principle that a-84 b-84 is an easily permeable chromophore comparing to b-155, one may assume that fluorescence regeneration by action of DNA on Hg(II)-C-PC complex occurs on the expense of a-84 b-84 located on the surface of C-PC. As for the remaining 90%, it can be ascribed to b-155. As opposed to Pb(II), for which specific binding sites may be basically b-155. The results obtained from the present study provide information about the quenching effect of Pb(II) and Hg(II) on the fluorescence of C-PC from Spirulina platensis and influence DNA on these complexes. Obtained results show that interaction of Hg(II) and Pb(II) ions on C-PC involves both ionic and hydrophobic interactions and more than one contact site. Specific interaction for Hg(II)- and Pb(II)-C-PC complexes differ from each other. T. Förster, “Mechanisms of Energy Transfer,” In: M. Florkin E. H. Stotz, Eds., Comprehensive Biochemistry, Elsevier, Amsterdam, 1967, pp. 22, 61-80.